So many men and so few women. A reality in the 19th century western American frontier. In the 1800s, Many single men left their farms, businesses, and homes to travel west in the search for a new life. Some for the promise of vast acres of land, others to find gold and silver ore, and a few for tracts of timber in the Northwest. Before long, in the territory west of the Missouri River, there was just one woman to every 200 men. At the end of the Civil War, the lack of marriageable men in the eastern United States was just as noticeable. 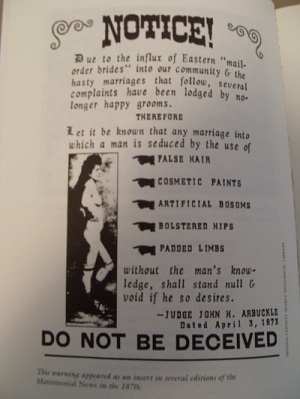 Ads for mail order brides offered a way for women in the east to find husbands in the west. And in the west, womenfolk were needed to tame the frontier because, without them, men seldom built schools, libraries, churches, or even flower gardens. If a man traveled east to find a wife, someone could try to claim his land while he was gone. It necessitating them to figure out other ways of finding women. A few men wrote home, asking friends and family if they knew any nice gals who might make good wives. 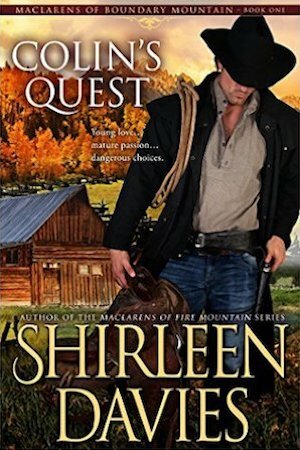 The entire courtship took place through letters until the couple decided to marry, then the woman traveled west to start her new life. Many men advertised in eastern newspapers for wives, and interested women wrote back if they had an interest. 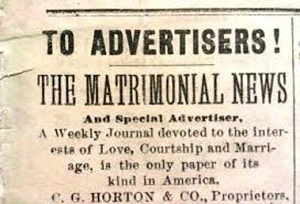 The Matrimonial News published ladies’ personals of 40 words or less for free, and gentlemen’s personals of 40 words or less for 25 cents. Any personals over 40 words, cost a penny a word. The editors numbered each personal ad instead of listing names and addresses. 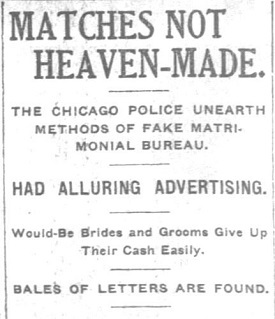 Interested parties sent replies to The Matrimonial News offices, clearly marked with the numbers of the ads. From that point on the process was pretty much the same as for men who found wives through family and friends back home. 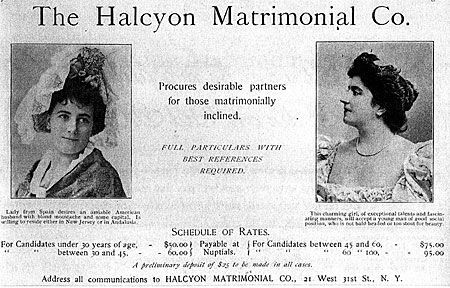 Sometimes women advertised in western newspapers looking for a husband. The courtship process was the same as if she was answering an ad rather than writing one. Most women who placed ads or answered ads couldn’t finding eligible men at home. Some had motives for leaving home such as strict parents, a ruined reputation due to a scandal, a desire for adventure, or a fresh start after something bad happened. These women needed to find husbands who lived far away. Many frontier marriages were made this way. Some cowboys shunned matrimony for the free-living life of a bachelor. However, most homesteaders found the farming life easier with a wife. 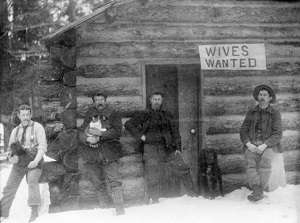 The scarcity of women in the west forced traditional-minded, lonely men to use unconventional means of finding a spouse. Letters were the only means of courtship between these couples who were separated by thousands of miles. Illiterate men dictated their letters to typists who, for a fee, composed their sentiments for posting by U.S. mail. 214—Respectable young man, with good position in city, 20 years old, desires the acquaintance of a modest young lady, between the ages of 17 and 21, with home nearby. Object: to attend operas and church; perhaps more. 233—Answer to 82—There is a lad in Missouri with a foot that’s flat, with seeds in his pocket and a brick in his hat, with an eye that is blue and a No. 10 shoe—he’s the “Bull of the Woods” and the boy for you. 252—I move in the best society, am 28 years of age, weight 168 pounds, height 5 feet 8 inches, light complexion, heavy mustache, and would like to correspond with some young lady, object matrimony. 257—Wanted: Someone to love, who will be true and sweet, and not only a darling dove but truly a wise helpmate. She must be of noble birth, whose worth could not be told, as misers count that sordid worth, of stocks and bonds and gold. 266—I want to know some pretty girl of 17 to 20 years. I am 29, 5 feet 9 inches tall, a blonde: I can laugh for 15 minutes, and I want some pretty girl to laugh with me. 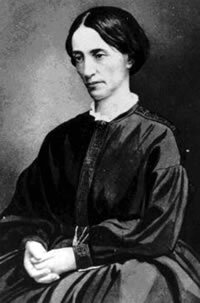 268—Two good-looking young men in a Missouri town, having money at their disposal, would be pleased to correspond with two jolly young ladies. Object a quality time and its results. 282—A widower, merchant, and stockman lives in Kansas, 46 years old, height 6 feet, weight 210 pounds, brunette, black hair and eyes, wishes to correspond with ladies of same age, without encumbrances and with means, must move in the best society and be fully qualified to help make a happy home: object, matrimony. Sometimes men, and women too, misrepresented their appearance, their station, or their financial situation. Despite the occasional mismatch or short-lived union, historians at the National Archives in Washington, D.C. found that mail-order matches resulted in a high percentage of lasting marriages, primarily because the seekers were honest and direct in stating what they expected from a spouse. If requested, the prospective brides and bridegrooms sent photos of themselves along with additional background information. In addition, when the couples met, the groom-to-be signed an agreement not to abuse or mistreat the bride-to-be. The bride then signed an agreement not to nag or try to change her intended. These agreements were always signed by three witnesses. Mail order couples wed in hopes these matches would grow into love matches. History shows that many times these mutually beneficial partnerships developed into a life of love, laughter, and a happily ever after. 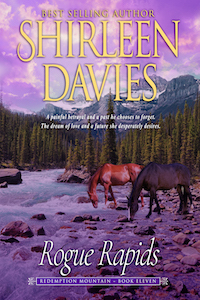 Mail order brides is an important aspect in my newest release, Rogue Rapids, book 11 in the Redemption Mountain historical western romance series. 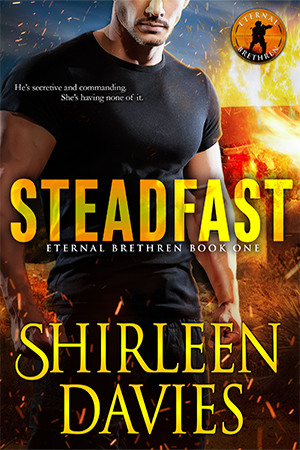 It is currently on PreOrder, with a release date of July 31, 2018.